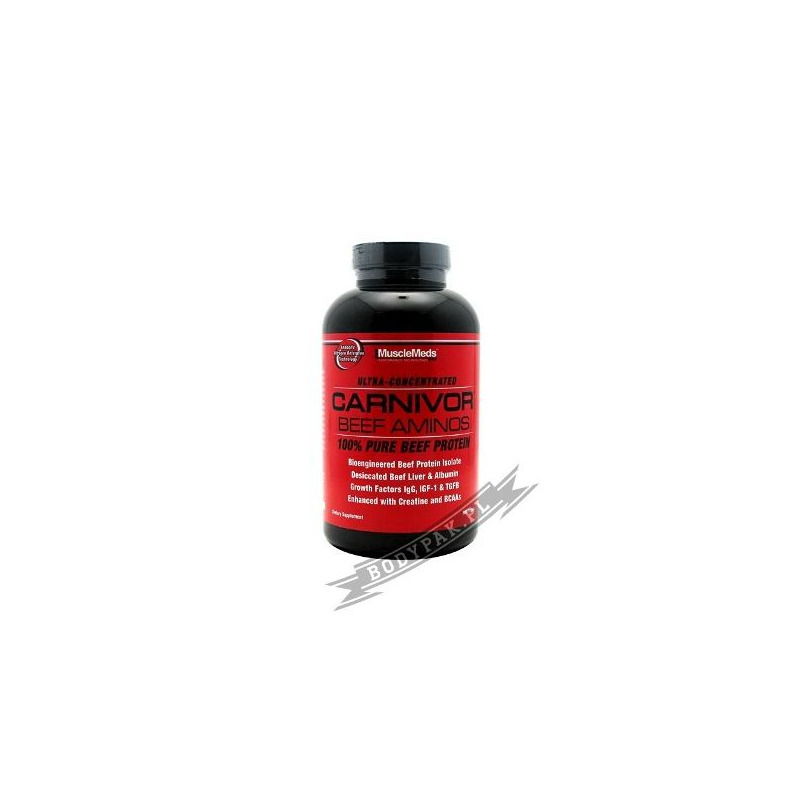 Amino AcidsMuscleMeds Carnivor Beef Amino - 300 tabl. 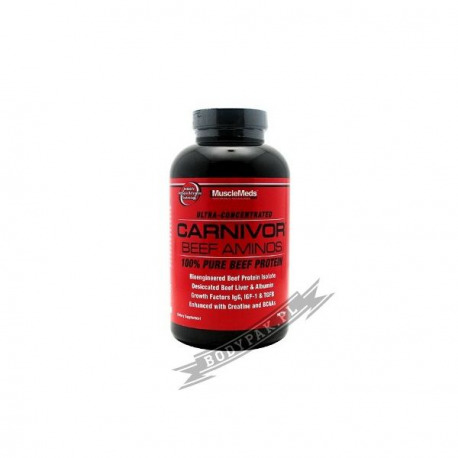 MuscleMeds Carnivor Beef Amino - 300 tabl. Carnivor Beef Amino - Unique isolate beef in the form of tablets. Carnivor Beef Amino is the world's first beef protein isolate carnivor is 350% more concentrated than steak and much more concentrated than whey protein, which does not contain any fat or cholesterol! Kai Greene was the object of tests conducted by researchers MuscleMeds. The experiments involved the development of formula supplements. After completion of the study revealed to the media the results and allows the product to sell. The result of the experiment was a great success and a breakthrough was to use (currently the most important in bodybuilding) macrocomponent - proteins. When the researchers determined the amount of protein consumed by Kaia, they come to the conclusion that the bodybuilder made more progress, basing their diet on beef than when taking whey protein and casein. Kai achieved great gains consuming 2-3 kg of beef a day, but the amount of red meat resulted in upset stomach. Unsatisfactory was also the level of absorbed fat and cholesterol, which exceeded the limit assumed by scientists MuscleMeds. The experiment led to the creation of Carnivor, the world's first beef protein isolate, which has become a key factor in the growth of muscle mass Kai and Arnold Classic competition allowed him to win the first place. The world's first beef protein isolate Carnivor is 350% more concentrated than steak and much more concentrated than whey protein, which does not contain any fat or cholesterol! Carnivor uses the latest technology of extraction, hydrolysis and isolation, thus providing muscle building the capacity of proteins red meat with higher levels of amino acids than any protein using whey, soy, milk or eggs. Anabolic Nitrogen Retention Technology (ANRT) recycles amino acids and minimizes the emission of ammonia ANRT is the biggest breakthrough in muscle building supplements. While protein is critical for muscle growth, paradoxically, may prove to be an inhibiting factor increases. It works here a simple mechanism: the more protein means more production of ammonia, which inhibits the development of the masses, if not properly neutralized. ANRT is an advanced technology, and to neutralize the ammonia, and re-use of amino acids in anabolic pathways, making the muscles by increased retention of nitrogen. 20 times more creatine than steak One of the advantages of beef is high creatine content. Beef is one of the best natural sources of this compound. To raise the activation of anabolism and fill the muscle cells to a higher level, each serving of Carnivor supplies 20 times more creatine than steak, filling your muscles for explosive strength and growth. The addition of BCAA to increase anabolism and reduced catabolism To further enhance the anabolic power of muscle building, Carnivor contains an extra dose of BCAA (branched chain amino acids), which added to isolate the protein of beef, a positive effect on nitrogen balance, increases protein synthesis, reduce catabolism and reduces post-exercise fatigue .